A spike in demand for the Navy’s attacks submarines, just ahead of a spate of decommissionings and a dip in new SSN construction, is leading the Navy to look at some previously unthinkable measures to mitigate the upcoming shortfall in the fleet. 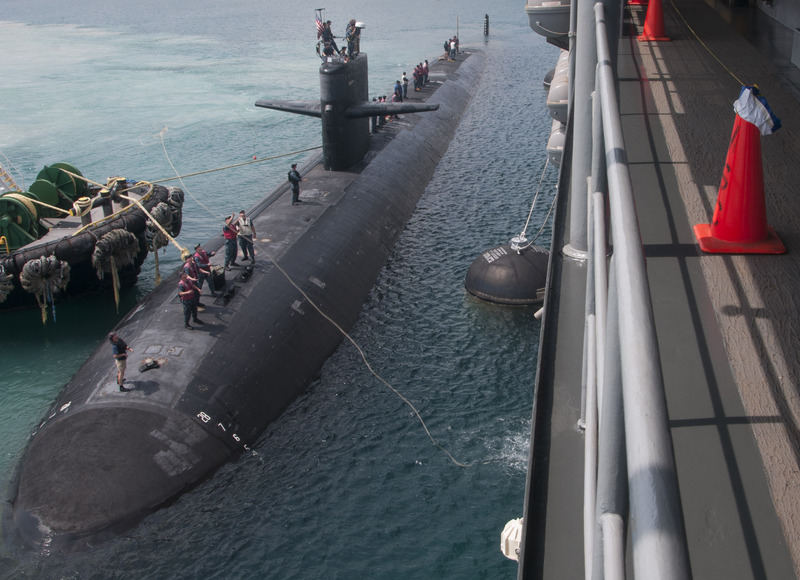 Those measures include extending the life of some legacy boats and increasing submarine production despite the cost and workforce strain the Ohio Replacement Program will put on the Navy and industry. The Navy has known it would face a trough in its attack submarine fleet since before 2006, when analysis was done that led to the 48-SSN requirement. Since that time, however, demand for the platform has gone up and funding has gone down, making a tough situation even more dire, Navy officials told USNI News. 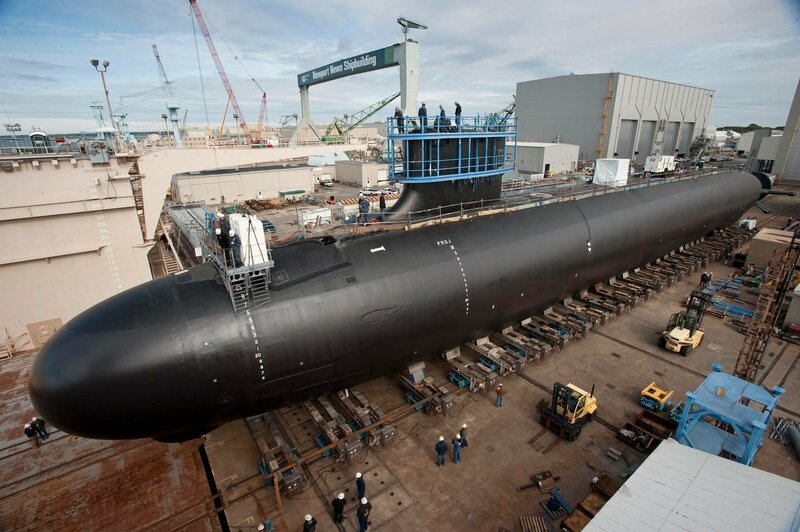 Even though the Navy’s Fiscal Year 2017 budget request released in early February called for just one attack submarine to be built in 2021 – a deviation from the current two-a-year build rate to accommodate the construction of the first Ohio Replacement Program ballistic missile submarine – just two weeks later officials floated the idea of trying to find money to buy back that second attack sub. USNI News spoke to Navy and congressional leadership to understand the dynamic situation and the events that led up to the submarine shortfall. The shortfall in attack submarines – set to span 2025 to 2036 and then 2038 to 2041 – didn’t catch anyone in the Navy off-guard. 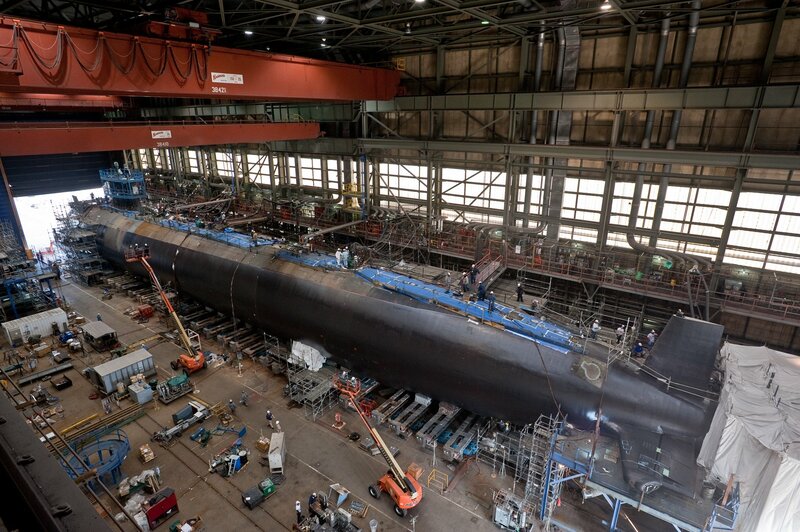 Program Executive Officer for Submarines Rear Adm. Michael Jabaley told USNI News in a March 3 interview that the Los Angeles-class attack subs (SSN-688) were built at a rate of up to five or six a year and are now approaching the end of their service life. Even building Virginia-class attack subs (SSN-774) at a two a year – a rate the Navy finally reached in 2011, after years of building either one or no attack subs, and has fought to maintain throughout sequestration and congressionally mandated spending caps – the shortfall is inevitable. Current events, though, have shaped the trough in the fleet size and made the shortfall’s existence more dire. Despite a desire to continue building Virginia-class boats at two a year, the most efficient rate for today’s workforce and shipbuilder infrastructure, “when we laid the Ohio replacement class into the budget, due to budget constraints the Navy felt it could only afford one Virginia in each year it procured an Ohio replacement, so that made that trough even worse,” Jabaley said. “There’s always the tension between the budget and warfighting requirements. … You don’t want to be in the position where there’s a budget-driven strategy,” he said, but to an extent that’s been the case with the Virginia class looking into the 2020s. Seeing this situation approaching, the Navy devised a three-pronged approach in the mid-2000s to try to mitigate the upcoming strain on the attack sub fleet. First, the Navy would consider extending the life of the Los Angeles-class boats – something almost unheard of with the carefully managed nuclear-powered subs. Schedules, and therefore nuclear fuel consumption, for these boats are rigidly managed throughout the life of the sub, and conventional wisdom dictates that a sub’s service life cannot be lengthened. However, Jabaley said, the Navy has found some exceptions to the rule. A couple years before each Los Angeles-class sub hits the end of its life, the Navy has begun an engineering analysis process. First, will there be enough nuclear fuel to support a six-month deployment tacked on to the end of the boat’s life? If yes, proceed to the next question: will the submarine still be structurally sound enough to support submerging and operating for an additional six months? Jabaley said the Navy would not pay for additional work to extend the life of the boats, but if the answer to both questions happens to be yes then the Navy will deploy the Los-Angeles class boat once more, providing a bit of extra overseas presence to fill combatant commander needs, before retiring the boat. Second, Jabaley said the Navy began lengthening some Los Angeles-class deployments – also considered taboo. 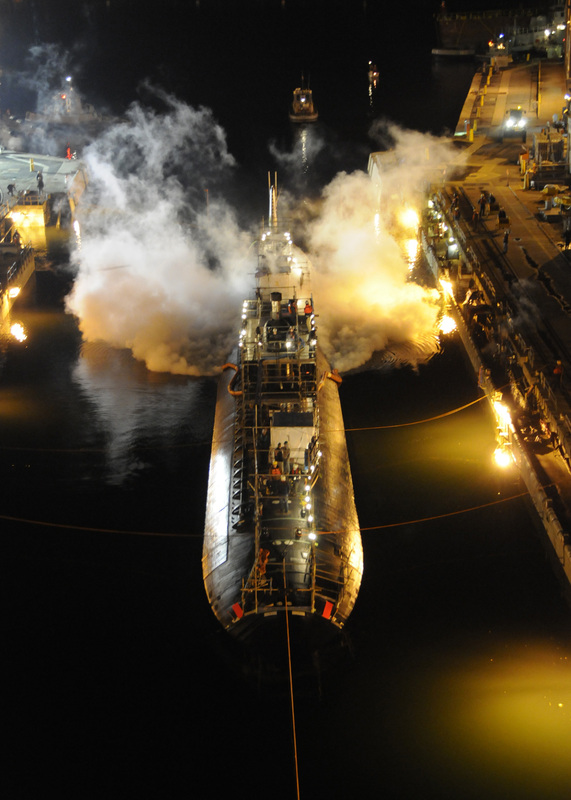 “By deploying for eight months instead of six, you’re using incrementally more fuel than you would otherwise in a normal operating cycle, so that can actually be counterproductive to the ability to extend that same submarine when you get to the end of life,” Jabaley said, explaining that submarines consume nuclear fuel more rapidly during overseas deployments than during in-port training or maintenance availabilities. Despite the complications it presented, Jabaley said the lengthened deployments were worth the extra overseas presence they provided as well. Third in the mitigation strategy, the Navy would try to build the new Virginia-class submarines faster. 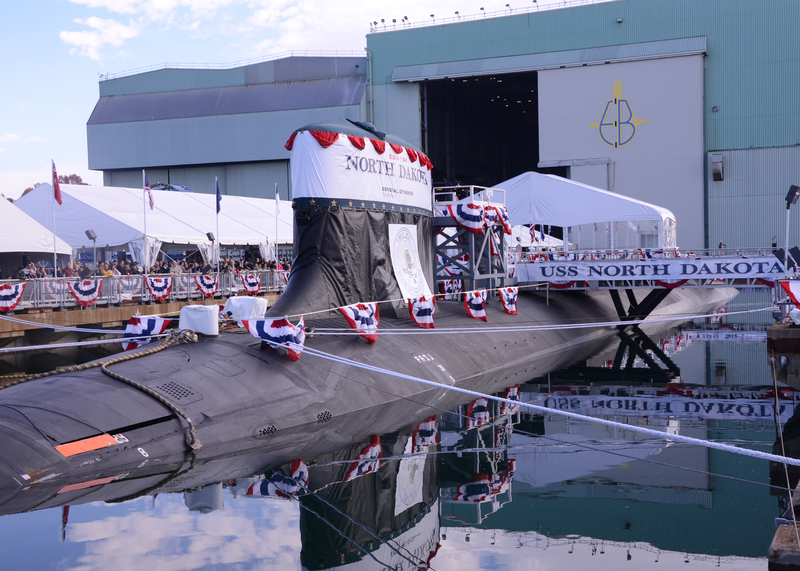 Whereas the first Virginia-class boats took about 84 months to build, General Dynamics Electric Boat and Newport News Shipbuilding now can deliver a sub to the fleet in about 61 months. “We have a goal to get down to 55 months, the shipbuilders have a plan they call ‘Drive for 55,’” Jabaley said. That plan revolves around “productivity improvements, changes to the manufacturing and assembly plan to be able to deliver a submarine in as short a time as 55 months.” The faster the industrial base can deliver each submarine, the faster those boats can get through training and get out to sea. The Los Angeles-class attack submarine USS City of Corpus Christi (SSN-705) maneuvers into position to moor alongside the submarine tender USS Emory S. Land (AS-39) to complete repair maintenance actions in Guam in September 2015. US Navy photo. “That was all well and good in 2006: we had a problem, we knew we were facing it,” Jabaley said. “But things have changed since then. In particular, the resurgence of Russia and the ascendance of China, both of which are producing numerous submarines, and in particular in Russia’s part, extremely capable submarines. So we’re facing challenges of both quantity and quality from our competitors. “And then of course the continuation of the long wars in Iraq and Afghanistan and terrorism in general, which submarines absolutely have a role to play in, although people might not recognize it,” he continued. Though attack submarine requirements can be hard to talk about publicly due to classification, the combatant commanders have, as Jabaley said, “started to proclaim quite clearly that they are not getting enough submarines on deployment.” During FY 2017 budget hearings, both U.S. Pacific Command commander Adm. Harry Harris and U.S. European Command commander Gen. Philip Breedlove made clear to lawmakers they are only getting about 60 percent of the submarines they request, and they need more to keep up with evolving Russian and Chinese threats. “All of that put together has made the urgency even greater,” Jabaley said. For Navy acquisition chief Sean Stackley, the entire situation presents challenges and opportunities. The challenge is maintaining the efficient two-a-year Virginia construction rate, while also moving into the larger Block V configuration in 2019 which includes a Virginia Payload Module section, while also keeping the Ohio Replacement Program on track – while grappling with other Navy shipbuilding needs, and while adhering to spending caps from Congress. The opportunity, he explained March 3 at the American Society of Naval Engineers’ annual ASNE Day, is leveraging authorities given by Congress in the 2015 and 2016 National Defense Authorization Act to get creative. Not only did Congress give incremental funding and advanced construction authority for the Ohio Replacement Program to help keep costs down, lawmakers also passed a key provision “that allows us to look across programs, across years in terms of procuring material to buy it as efficiently as possible and drive cost down,” Stackley said. “Quietly in the background we’ve been working with industry to figure out, given this significant amount of submarine workload coming, how can we best accomplish it in terms of not just efficiency but looking at facility investments that have to be made at our two boatyards, EB and Newport News,” Stackley said. “What we see is opportunity, and if we don’t nail that opportunity down, if we let 2021 pass, we are not going to get that boat back in the future and it just deepens the valley we’re looking at,” he concluded. Jabaley explained that the 2021 submarine is the most important for shaping the submarine shortfall. The shortfall would begin in 2025 or 2026, depending on the success of the effort to extend the life of the Los Angeles boats. A Virginia-class boat procured in 2021 would deliver in 2026, possibly staving off the start of the shortfall another year. Then, that boat would decrease the depth of the shortfall each year, slightly decreasing the impact felt by the fleet. And it would negate the one-sub shortfall expected in the last year of the trough, in 2036, and from 2038 to 2041. Put another way, Jabaley said there is currently a 51 SSN-year shortfall over 17 years. The addition of the second 2021 boat — and its subsequent effects — could reduce the attack boat shortfall to 35. Stackley tasked Jabaley and the rest of PEO Subs with making it happen, and he made clear last week how serious he was about buying back the second boat in 2021. “That’s frankly our requirement this year inside our shipbuilding program to figure out how to get there because that is our asymmetrical advantage: we own the undersea domain, we cannot give it up and 2021 is our next big opportunity to deepen, frankly, deepen our hold on that,” Stackley said. When the Navy signed off on the Block IV Virginia-class contract in 2013, Navy Secretary Ray Mabus likes to say the service got 10 subs for the price of nine thanks to a series of efficiencies the Navy and industry identified. The Navy must now pull off something similar to squeeze in the must-have 2021 submarine. Electric Boat and Newport News Shipbuilding have built several new facilities at their yards tailored to the Ohio Replacement Program, and “the end result is that at Quonset Point and in Groton (both at Electric Boat) and in Newport News there is some – but there is not very much – overlap between the facilities that you’re going to be using for Virginia and for Ohio Replacement,” Jabaley explained. “So you can still continue to produce the modules for Virginia at your desired two-per-year cadence at the same time you’re starting the production of Ohio Replacement. We are convinced we can do this by adding the one submarine in 2021. “Now, if you were to all the sudden say we don’t need 48 SSNs, we need a number which is a lot higher, and people start saying, okay, well can you add in that second Virginia every year you’re doing an Ohio Replacement? Could you do three Virginias in a year you’re not doing Ohio Replacement? What about three where you are? At some point … you’re starting to have collisions between all the work in progress and you’re now talking a huge expansion in facilities and work force. And we’re not ready to say that,” Jabaley continued. With industry on board and ready for the workload, the next question is how to pay for the second 2021 attack sub. First, “there are some savings just by adding it in,” Jabaley said, due to the savings that buying more units creates throughout the supply chain. And lastly, as Stackley alluded to in his comments about the contracting authorities provided in the NDAA, there are savings to be had if the Navy can find creative ways to move away from stovepiped contracting for each ship class and look more holistically at its overall shipbuilding needs. “I need to bring [the Virginia class and Ohio Replacement Program] together, and I need to employ innovative contracting and acquisition strategies to find synergy and cost savings,” Jabaley said. 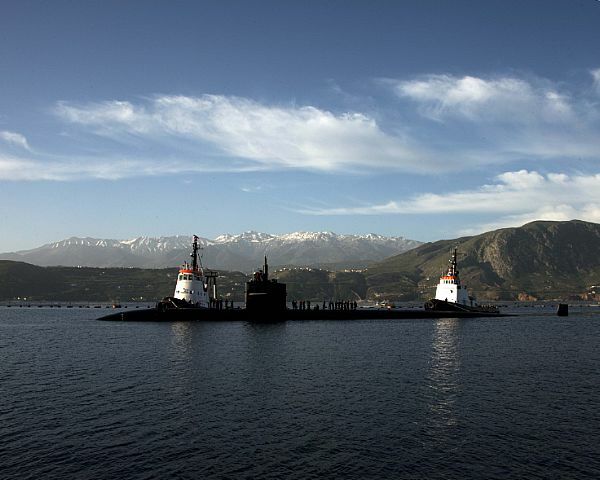 The Los Angeles-class fast attack submarine USS Newport News (SSN-750) arrives in Souda Bay, Greece Feb. 28, 2016. US Navy photo. Fortunately for the Navy, some lawmakers are already onboard. Rep. Joe Courtney (D-Conn.), ranking member of the House Armed Services seapower and projection forces subcommittee who represents the Groton area, said he believes the momentum has shifted to the side of those pushing for more subs in the budget. In December the Congressional Budget Office found that the National Seabased Deterrence Fund and its authorities that Stackley and Jabaley spoke of could help the Navy save $10 billion over the course of the Ohio Replacement Program – money that should be used to help pay for the 2021 attack sub. In fact, Courtney said the yards would need clarity sooner rather than later about how far Congress and the Navy might go, but he said he would support trying to continue the two-a-year Virginia procurement throughout the 2020s, even in years when Ohio Replacement subs are being built. “If you look at the tile chart … even adding the sub in 2021, we’re still going to be below the 48-submarine requirement, which has been out there since 2005,” Courtney said.